Dr Greggory Pinto is a Bahamian born and raised Urologist and Laparoscopic Surgeon, the son of veteran educators Alan and Joan Pinto and the nephew of National Hero veteran educators Marjorie Davis and D.W. Davis. Dr Pinto is a member of the European Association of Urology and the World Endourology Society. 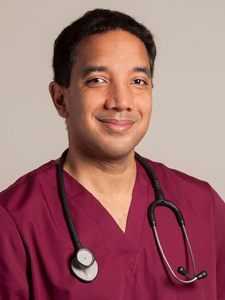 Dr Pinto pursued bachelors undergraduate studies at Simon Fraser University, British Columbia, Canada and his medical degree from the University of the West Indies, Mona, Jamaica. Less than 8 percent of North American and European Urologists can perform Urethroplasty surgery and only one in 400 can perform Urethroplasty at a world class level, making the Bahamas fortunate to have Dr Pinto’s skilled surgical Urethroplasty Expertise. Dr Greggory Pinto pursued residency training in General Surgery and then UROLOGY at the World famous Groote Schuur Hospital, Cape Town, South Africa; site of the world’s first successful heart transplant in 1967. The University of Cape Town Urology department was made world famous itself by graduate alum urologist Professor Van Der Merwe, who performed the world’s first successful Penile Transplant. Dr Pinto was awarded a Fellowship by the College of Urology, South Africa and became a Consultant Urologist. He then sought higher sub specialty Fellowship training in Endourology in Hamburg, Germany under the Tutelage of Professor Andreas Gross, a World Renown Renal Stone surgery authority and a trail blazing world pioneer of Thulium Laser Prostate resection enucleations. Dr Pinto is a minimally invasive kidney stone surgeon, in both endoscopy and key hole surgery. Dr Pinto attended the University of Strasbourg, France and received further sub specialty Urology specialization in Da Vinci Robotic surgery and minimally invasive Laparoscopic Urological Surgery and was certified and received a French diploma in Advanced Laparoscopic Surgery. Dr Greggory Pinto became a sub specialist Fellow in Reconstructive Urology and Urethroplasty Surgery with Professor Sanjay Kulkarni, who is considered to be one of the top three Urethroplasty Surgeons in the world. Professor Kulkarni has revolutionized modern day minimally invasive Urethroplasty (Urethral Stricture corrective surgery) and developed the Kulkarni Technique. The Kulakarni technique is used extensively throughout the world by highly trained urologists. Less than 8 percent of North American and European Urologists can perform Urethroplasty surgery and only one in 400 can perform Urethroplasty at a world class level, so the Bahamas is fortunate to have Dr Pinto’s skilled surgical Urethroplasty Expertise.